View Complete Information Package by email. This is a very unique wilderness / lakefront property (all buildings are on the PTNW 7-58-7 W3 and includes (1) cabin which was built in 1990s, with 2 bedrooms, loft, kitchen, living/dining room, wood stove, storage room with sink and tub, ran with lake water, small hot water heater, all power was supplied by generator (not included). Judith’s cabin is listing at $25,000. 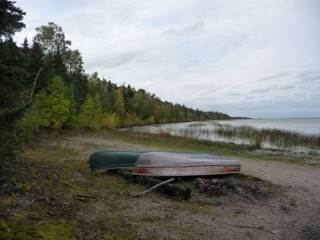 Property is on the west shore of Delaronde Lake in the forest, there is no grid road to it, access is by trail or boat.